Chair-washing M00713, buy at the price of 527 in Europe. 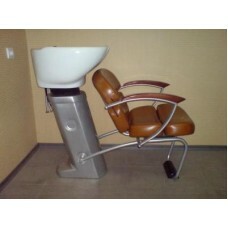 The company European Medical Systems offers only professional quality equipment and furniture for beauty salons. This section represents a practical and durable chair-washing M00713 for hairdressers of high level. Quality metal, durable and practical upholstery, convenient for visitors tilt seat and sturdy construction, which will withstand even a "big" client. Buying chair-washing M00713, you get furniture, which will serve you for many years, furniture that is pleasant to use, both specialists and visitors, furniture that is easy to transport. All you need to do - add this excellent model for barbershop in a virtual shopping cart and soon the chosen model will generate income for you and your business.